Sayles Tour, originally uploaded by sugarfreak. Next Thursday, May 5th, John Sayles will be at Atomic Books to read from his new novel, A Moment in the Sun. Ready to try some new blank forms? 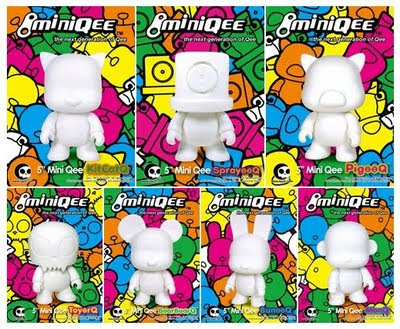 Toy2R has just released their new selection of 7 Mini Qees! Also, this Saturday (April 30) is the last day of the Vinylmore 4 exhibit. Since the opening night was rather packed and chaotic, we thought this would be a good chance to meet the artists, and for them to maybe talk a little bit about their process, technique, etc. So this Saturday will be a Vinylmore 4 closing party - 7pm-9pm. We'll have some refreshments and announce who the People's Choice winner is! It's springtime! Springtime means bugs. 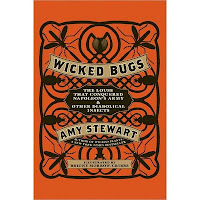 Fortunately Amy Stewart is here to help you prepare with a witty and disturbing follow up to Wicked Plants. Wicked Bugs: The Louse That Conquered Napoleon's Army And Other Diabolical Insects, is just chock full o' all kinds of useful bug-related information. This A to Z compiles over 100 insects that infest, infect, and generally wreak havoc on human affairs. 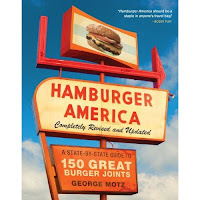 Yesterday, when I was out grabbing what proved to be a rather disappointing burger for lunch, George Motz's new, completely revised and updated version of his roadside classic, Hamburger America: A State-By-State Guide To 150 Great Burger Joints arrived at Atomic. And while Motz's book may not have helped me at the time anyway, since Maryland is completely overlooked, there are listings for Washington DC's Ben's Chili Bowl and Tune Inn, Virginia's Texas Tavern and Pennsylvania Charlie's Hamburgers and Tessaro's. Anthony Bourdain calls the book "A fine overview of the best practitioners of the burger sciences." And David Page, the creator of Diners, Drive-Ins and Dives calls Motz "the Indiana Jones of hamburger archeology." Mo Rocca and John Waters in Baltimore yesterday. John Waters was a special guest for a live taping of Wait Wait, Don't Tell Me in Baltimore last night, which airs this weekend. You'll have another chance to meet John when he'll be back at Atomic Books for a signing for Role Models, which is coming out in paperback next month! HappyEaster, originally uploaded by sugarfreak. We'll be open from 11am - 3pm this Sunday! This Thursday, April 21st, Will Potter will be at Atomic Books for a discussion about topics on environmentalism, activism and eco-terrorism from his new book, Green is the New Red. We are huge fans of the FX series Justified. It's sort of like Deadwood meets Dirty Harry as imagined by Elmore Leonard. And that last part sort of makes sense since he's an executive producer of the show and it's based on some of his work. So if you can't get enough of Raylan Givens and Justified, check out these Elmore Leonard Raylan Givens stories. Vegan Donuts, originally uploaded by sugarfreak. It's Record Store Day so you know what that means - Vegan Donuts! Donuts by Goody Goody Gumdrops. Author and Comedian, Jane Borden, will be here Wednesday night to present her new book, I Totally Meant to Do That. Starts at 7pm with adult beverages! Record Store Day This Saturday! A few years ago, some folks were inspired by Free Comic Book Day (coming up the first Saturday in May) and created this awesome thing called Record Store Day - a day when a bunch of bands and labels release limited edition special pressings of records that go on sale on that day to celebrate and support record stores. 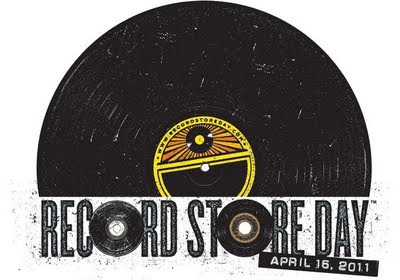 Record Store Day is this Saturday, April 16. Numerous record stores throughout the area will be participating, including Celebrated Summer Records. Also, 10% of what Celebrated Summer makes on Record Store Day is going to be donated to the Red Cross for Japan Earthquake relief. There will be both vegan and regular donuts available when the record store opens at 11AM on Saturday AM. To keep up with all the titles they'll be offering, visit the CSR Facebook page where Tony is posting updates. April's Reading Club Pick is Ray Bradbury's The Martian Chronicles. See you April 27th for the discussion - 7:30 at Atomic Books. "From the Manson murders to the fall of the World Trade Towers, The Color of Night is about the persistence of violence in America as experienced through the mind of a woman warped by its impact." Come meet the author! Hosted by Kathy Flann. 7-9pm. It's First Friday! In Hampden that means that many shops around the Avenue (36th Street) are having special events and/or sales tonight. So walk around, there are other businesses that will just be open a little later than usual! Events are between 6pm and 10pm.